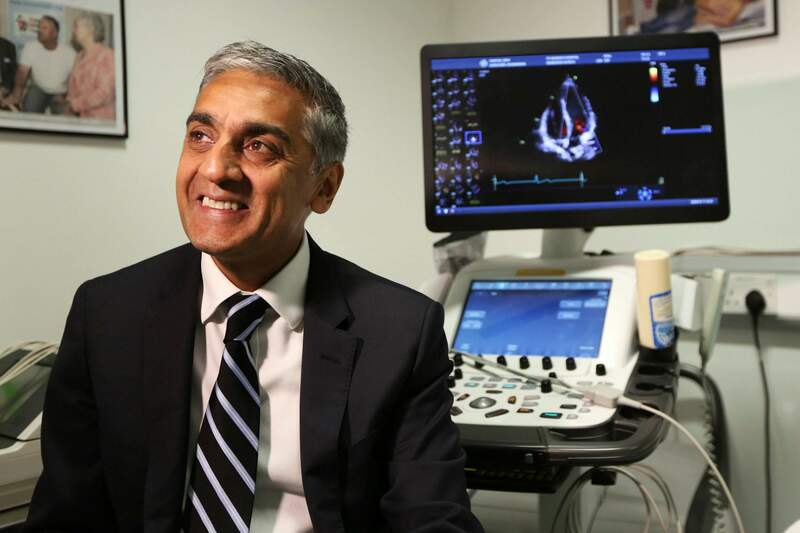 Dr. Sanjay Sharma, professor of cardiology at St. George’s University of London, speaks during an interview Wednesday about a study he led which found procedures that can help identify athletes who are at risk for heart-problems. He said the British soccer program will start re-checking players’ hearts at ages 18, 20 and 25. WASHINGTON – What kind of heart check-up do young athletes need to make the team? A large study of teenage soccer players in England found in-depth screening didn’t detect signs of trouble in some athletes who later died – yet allowed others at risk to get treated and back in the game. At issue is cardiac arrest, when the heart abruptly stops beating. It is rare in young people, especially athletes thought to be at the peak of health. But sometimes the strenuous exertion triggers an underlying heart problem and how to find the young athletes most at risk before a collapse is hotly debated: Do they need routine EKGs added to their pre-sports check-ups? The American Heart Association doesn’t recommend it, but European guidelines do. British researchers tracked how players fared in a costly screening program – and found no easy answers. The English Football Association requires cardiac screening for top teen soccer players that includes both an EKG, or electrocardiogram, which measures the heart’s electrical activity, and an echocardiogram that shows its structure. Between 1996 and 2016, 11,168 athletes were tested around age 16. Researchers examined those medical records and then tracked how many players who stuck with the soccer organization have died so far. As expected, the vast majority of the teen players were healthy. But 1 in 266 were found to have silent heart disorders that put them at risk of sudden cardiac arrest, researchers reported Wednesday in The New England Journal of Medicine. The good news: More than two-thirds of the 42 high-risk players had conditions that were fixed with surgery so they could safely return to play, said Dr. Sanjay Sharma, a cardiology professor at St. George’s University of London, who led the work. But eight of the originally screened players eventually died of cardiac arrest, within an average of about seven years. And only two of those deaths were players whose screenings had identified them as at risk. They refused to give up soccer. For the other six, that one-time screening found no signs of trouble. To Sharma, that’s no reason to avoid EKGs. Most of the deaths involved heart muscle disorders that can develop over time and there’s no magic age when they appear. So, he said the British soccer program will start re-checking players’ hearts at ages 18, 20 and 25. The risk equates to 6.8 deaths per 100,000 athletes, Sharma’s team calculated. The numbers may be small but “it seems like if it’s potentially preventable, we should probably be doing that,” said University of Washington sports medicine specialist Dr. Kimberly Harmon, who wasn’t involved with the British research. “I don’t want my athletes to die on me. If they have something that makes them more likely to die than the next guy, I want to know about it,” added Harmon, who has studied sudden cardiac arrest in NCAA athletes and supports EKG screening for both college and high school players. But extra screening can be costly – more than $4 million for the relatively small British program – and that helps determine access. The American Heart Association recommends a thorough physical exam and detailed family and personal medical history for every athlete, but not an automatic EKG. The idea is to look for red flags – like fainting episodes, a heart murmur or whether a relative died young of a heart problem – that would prompt further cardiac testing. At a cost of $25 to $100, automatic EKGs aren’t practical for millions of high school and college athletes especially since false alarms can require pricier further exams, said Dr. Douglas Zipes of Indiana University, who co-authored the heart association guidelines. Then there’s the ethical question of testing only athletes when youths not in organized sports sometimes die of these same heart conditions. Still, U.S. college sports programs increasingly use EKGs and parent organizations sponsor community screenings around the country. Screening aside, health authorities agree that defibrillators need to be within easy reach at sports practices and games and other public venues “so that when an individual – athlete or not – goes down, we have the capability to resuscitate,” Zipes stressed.